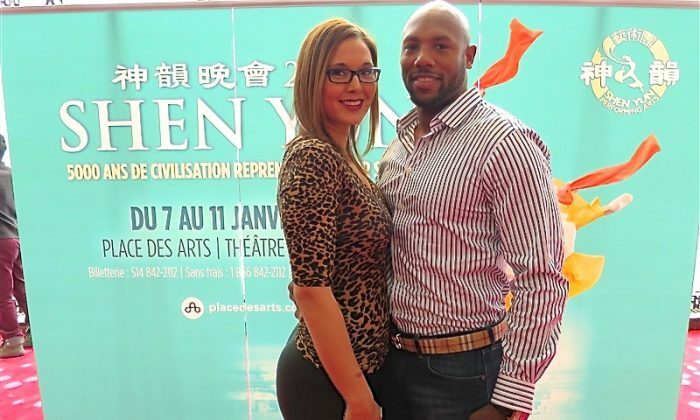 MONTREAL—Kyries Hebert is one of the hardest hitters in the CFL, but he’s got a soft spot for traditional Chinese culture and a deep admiration for the physical prowess of the classical Chinese dancers of Shen Yun Performing Arts. “I have a great respect for them, and the amount of time that they have to put into it to be able to perform at such a high level for such a long time,” said Mr. Hebert, a defensive back for the Montreal Alouettes. “It’s very impressive. It’s not something I could ever imagine myself doing, or being able to,” he noted after taking in Shen Yun at Place des Arts on Sunday afternoon, Jan 11. It was Mr. Hebert’s second time to see Shen Yun, having seen it in in Ohio a previous year. This time he wanted to come again and bring his girlfriend. “I saw the show and I told her about it and she was very interested. I think I did a good job in selling it to her because she was anxious to come,” he said. “It’s incredible. The colours, the dance. I truly love it,” said his girlfriend Anneth Him, a former basketball player and now teacher at an international Montessori school. “I have the feeling that I’m more in touch with my heritage. I’m a quarter Chinese and I don’t know any of the dances, so I’m learning a lot,” she said. Mr. Hebert said coming to Shen Yun taught him that the flipping and tumbling techniques people usually associate with gymnastics and acrobatics actually originate in classical Chinese dance. Shen Yun was founded in 2006 on a mission to revive 5,000 years of divinely inspired Chinese culture, a culture that was once rooted in principles like benevolence, justice, respect for the heavens, ideas originating from Confucianism, Buddhism, and Taoism. These were China’s three primary religions before the Chinese Communist Party came to power and began a systematic effort to wipe out traditional beliefs, according to Shen Yun’s website. Mr. Hebert said the values represented in Shen Yun were something that should be shared around the world. Ms. Him echoed that sentiment, noting especially one of two dances set in modern-day China. The dance, The Power of Compassion tells of Falun Dafa practitioners facing an attack by Communist Party policemen. While trying to arrest the meditators, a police officer slips and hurts his knee. The meditators stop fleeing and help the officer, eventually sitting down together to read Zhuan Falun, Falun Dafa’s main text. “I had heard about [Falun Dafa] in Chinatown, so it was good to see its philosophy, and it was a very beautiful philosophy. So it was good to see it interpreted through dance,” she said. Other dances tell of Buddhist monks, heavenly dragons, and literary heroes. It’s a performance that Ms. Him thought others should see. “The music is one of the most incredible aspects,” she added. Mr. Hebert said he was leaving the theatre feeling uplifted. I’m left feeling good, a feeling of positivity and excitement. “I’m left feeling good, a feeling of positivity and excitement,” he said. Mr. Hebert started his career in the NFL before being released from two teams and coming to Canada where he quickly found his stride with the Ottawa Renegades. He became one of the most feared hitters in the league and signed a contract that would have made him one of the highest paid defensive players in the league. He returned to the NFL for a couple years and is now with the Montreal Alouettes where he made the CFL All-Star team in 2012. Mr. Hebert is not all about the tackles tackles though. He also started the Ky Cares Foundation that hosts celebrity events and fundraisers for Cedars Cancer Foundation and the Quebec Breast Cancer Foundation. Moves like that earned him the Tom Pate Memorial Award in 2013 as a CFL player with outstanding sportsmanship and someone who has made a significant contribution to his team, his community and Association. Epoch Times considers Shen Yun Performing Arts a significant cultural event of our time. We have proudly covered audience reaction since Shen Yun’s inception in 2006.